"The app is so easy to use. 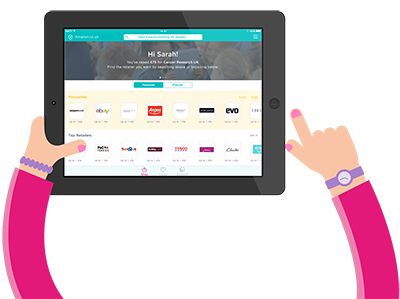 You just tap, shop and raise donations"
Remembering to collect free donations is even easier with the easyfundraising app. Use the app whenever you shop from your mobile or tablet and know that when a donation’s available your chosen cause will get it. The app doesn't cost a penny! We want to help you raise as much as possible for your good cause so we're giving it to you completely FREE! Yes it's completely secure for your peace of mind. The app has been fully approved by Apple and Google. None at all. The app is completely free of advertising, so there's no need to pay to have them removed (unlike other free apps). No. It doesn't record any personal or payment details at all, it simply tells the retailer that you’ve visited them through the app so that they can give your cause the donations you collect.